For foreign exchange industry, 2018 was a year of turbulence, uncertainty and volatility for GBP, USD and EUR. 2019 has not been dissimilar so far. So what’s in stock for us this year? At TFG, we’ve put together some of the key trends and events expected in 2019 that will continue to influence the direction of the world’s major currencies pairs (fair guesses at the time of writing but of course, subject to change)! Protecting margins is critical for any business owner or treasury manager. Trading businesses involved in cross-border trade and services across multiple currencies should be aware of the P&L risks of not hedging currency. The effects of some events may already have been taken into account in a currency price, meaning a sudden price change is unlikely. Understanding trading psychology is, therefore, important to consider. 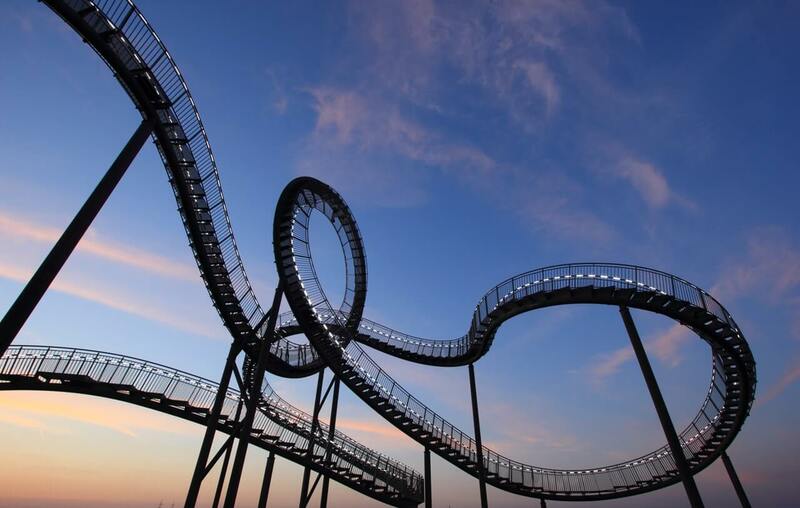 Potentially the biggest pressure on Sterling for years, Brexit could send the UK economy into a tailspin, or present untold opportunities (depending on your point of view). The issue is that, at the time of writing, no-one knows what Brexit means because a deal or no-deal split from the EU has not been agreed. Since collapsing when Britain first voted to leave the EU (see the dip in June 2016 in the chart above), GBP recovered a little but has in reality been floating within tight boundaries ever since. How Brexit materialises in March will be welcomed or met with fear by the markets. US interest rates. One of the key influencers on the USD price in 2018 was the US Federal Reserve hiking interest rates, sending the dollar higher. The interest rate was raised four times in 2018, and although the Fed indicated it might pause, the US economy remains strong, and there seems every chance of further hikes in 2019. UK/US trade. US President Donald Trump has made international trade and perceived ‘fairer’ tariffs a headline policy. That will continue in 2019 and could impact the UK/US business relationship, particularly after Brexit. Bank of Japan policymakers have not been united on bond yield targets and how widening its range could impact on the country’s 2% inflation target. There are concerns locally over falling oil prices and worsening global finances. However, a quirk of the Japanese Yen is that it is something of a haven in uncertain times. That said, one thing to monitor is the technical indicator on the chart. The above chart shows USD/JPY since 2017. Highlighted are the succession of ‘highs’ throughout 2017 and 2018, at around 115. Should the pair reach that point again, there could well be a breakout above that price. Monitor it closely, because traders in 2019 might also consider that as a natural ceiling price for the foreseeable future, meaning any rise to 115 will see the price bounce against it and drive another downward shift. The seismic shock to Sterling when Britain voted to leave the EU did not have the same effect on the EUR/USD pair. The outlook was bullish through 2017 and the first quarter of 2018. It fell back a bit and has now been stuck in the 1.14 range for the past few months. It’s like the pair is circling in a holding pattern but, like the GBP/USD pair, things might change quickly in 2019. The prospects for the Euro in 2019 will be influenced by Brexit. A ‘no deal’ break-up with Britain may be a bad deal for European partners, putting downward pressure on the currency and the EUR/USD pair. Pressures could be exasperated by continuing strength in the US economic situation. The Canadian dollar is often perceived as being one of the world’s most stable. However, the country does rely heavily on its natural resources, in particular oil. If the price of crude oil falls, this has a big impact on Canada. The back end of 2018 saw falls in crude oil from $76 a barrel to $44. How the price recovers in 2019 will impact the USD/CAD price. The pairing price will fall the better Canada does (because it takes fewer Canadian dollars to buy one US dollar). 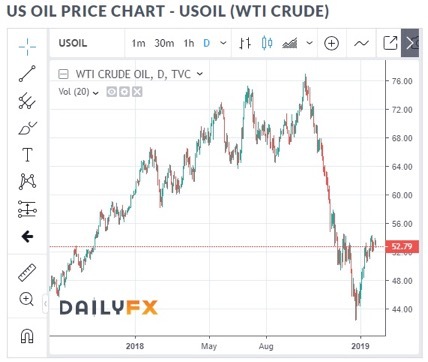 2019 has started with a recovery in the oil price to over $52, but will that oil price momentum continue?